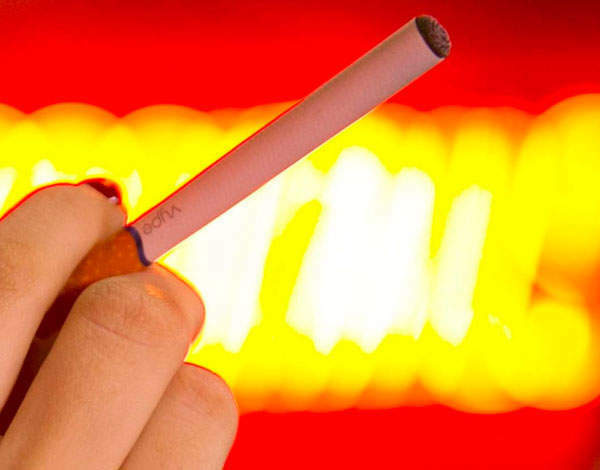 These six-inch plastic vaporising sticks, which create fake smoke on dragging, giving the feeling and effect of a cigarette, have taken the world by storm: over the past few years, e-cigarettes have transformed from gimmick into a $3 billion worldwide industry. Next time you are out, look closely as you see a glamorous women drag on an e-cigarette – it might blind you. E-cigarettes, not content with being a smoking substitute, are now becoming a luxury accessory akin to a Rolex or a Louis Vuitton handbag. For £997, Goldgenie.com will provide you with your very own 24-carat-gold e-cigarette, complete with a luxury cherry oak box. If that is too down-market, why not follow the example of one Russian oligarch, who in October 2013 was reported to have spent £550,000 on a diamond encrusted e-cigarette for his wife to kick her tobacco habit in style, complete with a £46,000 six-carat diamond on the tip? In theory, the use of e-cigarettes should primarily be health-related: a new, enjoyable way to cut tobacco use and, in guiding people away from that Camel Blue, save lives from diseases attributable to smoking. However, with every big idea comes big business, and for the first time in decades smoking ads have returned to British television screens as British American tobacco aired a commercial for its ‘Vype’ brand of e-cigarettes, much to the dismay and ire of anti-smoking campaigners. The science behind them is largely unproven and the health benefits are questionable – no-one really knows how good, bad or otherwise they really are for you. The only certainties are that smokers remain addicted to nicotine and after many years smoking has started to regain its classic allure. The centuries-old habit isn’t dying any time soon, even if its medium is changing. Nowhere better than in London’s nightclubs can one see the rapid success of these cigarette substitutes. Flaunting the smoking ban, anyone can electronically ‘light up’ inside, saving a 1am huddle outside in the cold, crammed smoking section. Women I have spoken to say they benefit by not returning home after a night out smelling like a 1950s pub ashtray. To the untrained eye, seeing a grown man puff on what looks like an illuminated tampon makes one question what can genuinely be classified as cool. However, for dozens of smokers, being able to puff away inside harks back to the glory days when a good nightclub or bar always had a mysterious, smoky haze – only without the haze. Now every Hublot-wearing consumer of premium nightclub tables can be a 21st century Marlboro man.